Girlia's Cards: Have a Flip Flop Birthday! Thanks again for stopping by. I am still practicing with coloring images and here is another digi to add to the collection (lol). I am not brave enough to color with my copics yet. I feel as though I still need to work with my shading and blending techniques more. Anyway...I am entering this image into the Designed 2 Delight Challenge where everyone is a winner. As always comments are welcome. Enjoy and GOD bless and have a Happy 4th !!! Very cute, I really like! Adorable! Love the flip flops! Love the color combo!!! Great job w/the image as well! Thanks for joining us this week at Designed 2 Delight. This is so pretty, Gloria! I love the colors you used and the flip flops are so cute! 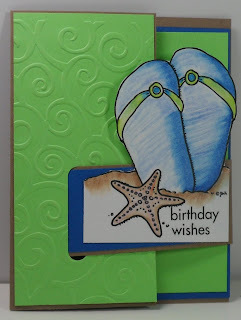 Such a cute card, love the flip flops! Happy 4th to you Gloria. Very nice, great choice on the embossing folder! Love your flip flop card. The coloring is great and I love the embossing. Great job! Darling, the embossing gives you the feel of swirling water!!! Love the colors and the "beach worn" look of the flip flops! I am so glad you could join us at Designed 2 Delight week.